Dodgers finalize contract with manager Dave Roberts. November. 08, 2018 07:44. by Heon-Jae Lee uni@donga.com. 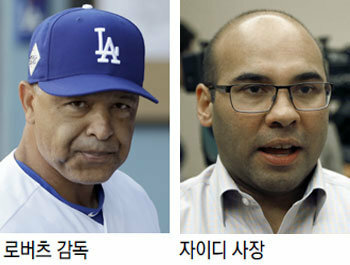 Los Angeles Dodgers manager Dave Roberts was the target of criticism in this season’s match with the Boston Red Sox in the World Series. Every time pitchers were replaced, they ended up failing. Dodgers had to hand over the trophy to Boston, losing 1-4. After losing the series for two consecutive years, Robert remarked that he expects “us to be back here next year," which came under fire. The public and the leaders of the baseball club thought differently, however. U.S. media reported on Tuesday local time that Dodgers has finalized contract with Roberts. The Dodgers manager agreed to a 3+1 year contract with Dodgers in late 2015. The three-year term ends this year with the following under the option of the club. While Dodgers extended the relationship by four years instead of exercising the option, it has been reported that Dodgers will triple Roberts’ salary to 3 million dollars.